Ever Clear Premium Spray is a clear, air-drying, two part lacquer designed to provide the best and strongest protection for most surfaces and finishes. 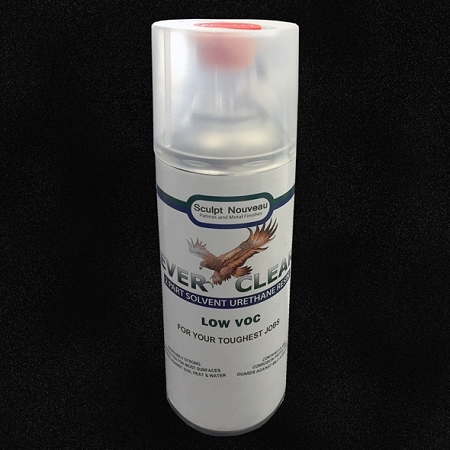 Use Ever Clear on your toughest jobs including counter tops, fountains, ocean environments, etc. It works extremely well on all metals, wood, terracotta, ceramics, and concrete. Ever Clear provides unusually strong under-film tarnish protection, superior resistance to UV light, and remarkable resistance in salty air environments. Sculpt Nouveau's Ever Clear makes an excellent coating to seal and preserve various oxidizing and coloring processes that are used for antique patina and decorative surface treatments. Make sure the surface is completely dry and dust free before applying Ever Clear. After following directions for activating spray can, press spray button firmly, with the can 10 inches from surface being coated. Move can with short dusting strokes, releasing button at the end of each stroke, applying several thin coats. The second coat should be applied in about an hour. (If you are unable to apply the second coat in a timely manner, you may lightly sand the first coat, so that the second coat will adhere). Take measures to minimize dust and debris falling on your coated products. Metal surfaces should be room temperature (70-85F). Do not use when the temperature is over 85 F or under 50F. After activating the can, use within 6 hours. Do not use after this amount of time. DRYING TIME: The coating air dries to the touch in less than 1 hour depending on room temperature and may be forced dried faster at 250F. The coating air dries solid/hard film within 4 hours, depending on coating thickness, temperature, etc. Full cure dry time will be 5 to 7 days. 1) Shake the can well for 2 minutes before activating. 2) Remove the red push button from the cap. 3) Turn can 180 and put the push button on the pin in the can bottom. 4) Place can with the cap upside down onto a stable base. 5) Press the red trigger button with the ball of your thumb until the limit. 6) After activating, shake can well for 2 minutes once again.